Having read a rave review from Likely Impossibilities and warm praise both for the orchestra in performance and the vision of their conductor, Iván Fischer, from Jessica Duchen, I went into Tuesday's concert of the BFO with high expectations. Not only was I not disappointed... I was astonished. I was transported. I was delighted! And the rest of the audience in the far-from-full hall seemed to feel the same way. The above words from Fischer, by the way, are taken from the orchestra's website. In contrast with my usual last-minute habits, I bought a ticket for this afternoon's concert over a month in advance, eager to have a chance to see the Metropolitan Opera orchestra fully in the spotlight. I was not disappointed. The first and second halves were a study in contrasts: Mozart's Posthorn Serenade (officially Serenade in D minor, K. 320) was a graceful celebration of an ordered world. Mahler's Das Lied von der Erde, in a blisteringly intense performance, extolled the courage to live fully in the face of the temptation to live blindly, in a world teetering wildly on the brink of chaos. Ominous but helpfully labeled stairway. After a week of exhausting academic productivity, I decided to take a break today by going to a lecture. The Metropolitan Opera Guild's blurb for the first session of their Opera Boot Camp series, "Vocal Vocabulary," asked if I had ever tried to describe a performance to friends but found myself struggling for the terminology to communicate, precisely and passionately, what I meant. Why, yes, Opera Guild, I have! Regularly, on the internet, no less! In high spirits I set off in search of some help on my mostly self-educated course towards becoming a More Knowledgeable and Discerning Audience Member. In the event, the lecture was conducted with humor, charm, and energy. But it was not the Opera Boot Camp I was looking for. I suspect that Plácido Domingo himself is one of very few people in the world who can keep track of his prodigious and prodigiously varied achievements. As the opera world dons party hats, figuratively speaking, for his seventieth birthday on Friday (I rather hope that literal party hats might be involved somewhere; there was at least a surprise party) I thought this would provide a good excuse for the post I've long felt I've owed him, anyway. 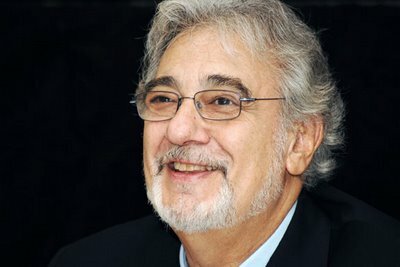 Plácido Domingo was one of the first figures in the world of opera I came to know: he's been Virgil to my Dante for much of the core operatic repertoire, and is primus inter pares among my Honorary Operatic Uncles. So, I'm putting on my own figurative party hat. Monday night was my third experience of Tosca in Luc Bondy's much-discussed production. It still strikes me as far from coherent, but last night it did offer some interesting ideas. These ideas didn't so much present a complete or compelling picture as float among costumes of 1800, film noir lighting, and Ikea furniture, but there they were. The lighting and staging both seemed even more Tosca-via-Raymond-Chandler than I remembered. An elderly gentleman sitting behind me, who had seen Tebaldi and Milanov, among others, in the role, plaintively remarked: "Well, it does focus one's attention on the singing, which I suppose is the point. But... I think a good production should say something." Well said, sir. One curious aspect was that all three of the principals seemed to have acquired something of Tosca's tendency for self-dramatization. Cavaradossi seemed the least aware of this, so maybe the overtly histrionic delivery was the fault of blocking. The theatrical Scarpia of Falk Struckmann, however, was deliciously, ironically self-aware; of this more later. My chief problem with the production remains that its visual and dramatic language is neither coherent, nor clearly propelled, as far as I can see, by ideas (other than general cynicism.) Hence the title of this post: what the production communicates is left largely up to the singers. Unofficial Verdi month is in full swing now: on Saturday night I headed to the Met for another round of Rigoletto. The Otto Schenk production is still ponderous, and the blocking still static; it's pretty, I suppose, but it does its singers no dramatic favors (acoustic ones, maybe.) Something to mull: Likely Impossibilities bears tidings that Met's next Rigoletto production will likely be soon, and likely be directed by Luc Bondy. For this run, there was an updated (1990) choreography in use. I think Gilda following the Duke out into the street after their scene is new (breaking spatial boundaries and the rules! foreshadowing of doom!) The courtiers during "Pietà, signori" turn their backs on Rigoletto one by one; I think this is to signify that they cannot hear him unmoved. Rigoletto actually comes over to Gilda to say "Fa scorrer il pianto sul mio cor"! Oh, and come to think of it, the libertine Duke's visible libertinism in the first scene might be updated choreography, and not just Joseph Calleja being a more creative actor than his predecessor. The thing is still creaky, though, if slightly less so. A slideshow of images from the current run, with Calleja's "La donna è mobile," may be found here. The current run of Traviata at the Met is very well served by its principals, gifted and expressive singers all. 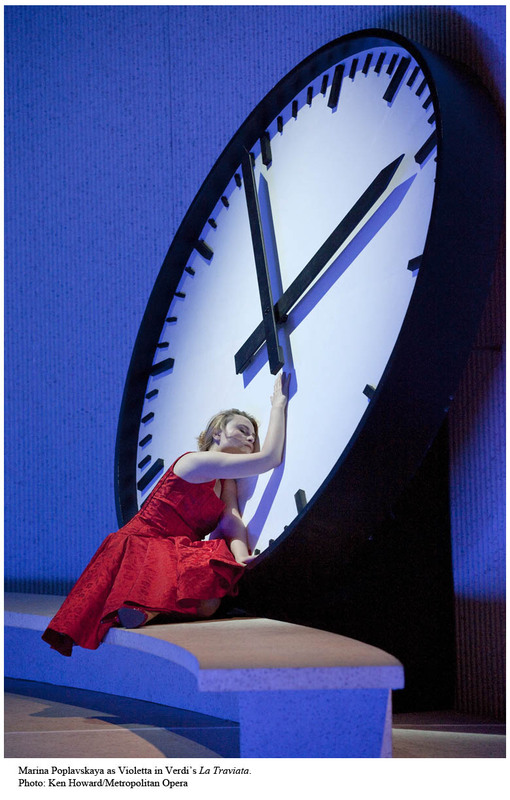 Moreover, Willy Decker's sleek, striking 2005 Salzburg production restores to the opera what Verdi wanted it to have: shock value. Dress rehearsal pictures here; lots of opening night photos here. Decker's production uses simple visual language for a straightforward, if not literalistic, reading of the Verdi/Piave drama, relentlessly emphasizing the voyeuristic, greedy nature of the chorus (male-dominated society), the artificiality of Violetta's pompose feste, and the tragedy of the disease which haunts her. Update: Gentle Reader asperias notes that the 15 Jan. performance will be available for listening online from the BBC at 18:00 GMT. Update II: the BBC does not, in fact, have the performance available for repeat listening; sorry about that. Gentle Reader S. has a list of other options in the comments section. The United States Postal Service has its unofficial credo to motivate it; opera fans have... well, what makes them opera fans. Snow descending on New York City and making me very relieved to be safely home via a still-functioning subway could not deter the diva-devotees who packed Carnegie Hall for Renée Fleming's recital. I have to confess that I couldn't call myself a diva-devotee, but I was not about to miss a program of Schoenberg, Zemlinsky, Korngold, R. Strauss, and a new Brad Mehldau cycle with Rilke texts (detailed program notes here.) I'll state my biggest reservation at the outset: I kept losing Fleming's consonants, and I found this both distressing and frustrating. Carnegie Hall generously provided their usual texts and translations, but still. I don't know whether this is an issue of general Textdeutlichkeit, or a peculiarity of phrasing, because I experienced a shadow of the same problem with the English-language songs. Fortunately, this did not vitiate Fleming's ability to communicate musically, and I was impressed both by the bold program, and by Fleming's commitment to the emotional arc of the selections. The pavements of the Bronx are icy, and I'm holed up getting work done instead of going to the opera. But before this blog resumes its regular programming next week, here's a tidbit to warm you in wintriest weather. In the two performances I've heard her in, Elina Garanca has wowed me with her vocal talent and ability, and left me wishing there were more apparent connection between her voice and the drama of the music she sings. Here she is, in a 2006 concert, singing "Les tringles des sistres tintaient." Her husband, Karel Mark Chichon, is on the podium. If you can't see the entire frame of this video in the blog, click through to YouTube so that you can. Cold is the last word I'd use. Am I imagining things? Is this hometown crowd magic? Should the opera houses of the world be asking for more of the Garanca-Chichon couple at the same time? I am currently making lists of all the operas I want to attend in the coming months, instead of lists of the hundreds of books I will have to read before comprehensive exams in the fall. Ah well. The Twelve Days of Christmas aren't over yet, so I'm digging my heels in and luxuriating in holiday relaxation. One niggling question is: do I want to play a rousing game of "collect them all!" with the Met's current season? I am not feeling particularly inspired by Armida, but should I go for the sake of coloratura? Despite having seen Tosca twice last season, I might go again for love of Sondra Radvanovsky (I've seen her in Trovatore and Stiffelio, and she was fabulous both times.) There are other will-I-won't-I debates, but I'll spare you my dithering, and borrow a thought from Likely Impossibilities: if there are Met or other NYC operas that you think I absolutely must not miss, let me know in the comments and I'll do my best to fit them into schedule and budget!